PASADENA, Calif. -- One of NASA's two Mars rovers has recorded a compelling saga of environmental changes that occurred over billions of years at a Martian crater. The Mars rover, Opportunity, surveyed the rim and interior of Victoria Crater on the Red Planet from September 2006 through August 2008. Key findings from that work, reported in the May 22 edition of the journal Science, reinforce and expand what researchers learned from Opportunity's exploration of two smaller craters after landing on Mars in 2004. The rover revealed the effects of wind and water. 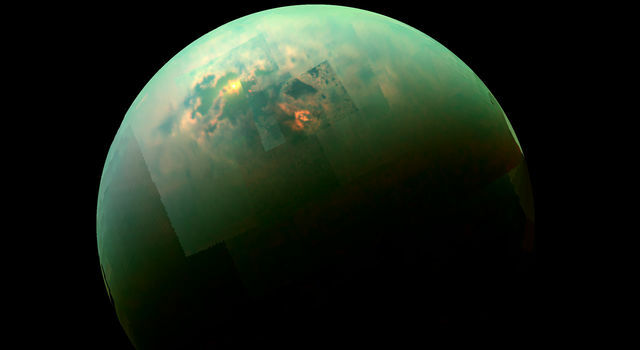 The data show water repeatedly came and left billions of years ago. Wind persisted much longer, heaping sand into dunes between ancient water episodes. These activities still shape the landscape today. At Victoria, steep cliffs and gentler alcoves alternate around the edge of a bowl about 0.8 kilometers (half a mile) in diameter. The scalloped edge and other features indicate the crater once was smaller than it is today, but wind erosion has widened it gradually. "What drew us to Victoria Crater is the thick cross-section of rock layers exposed there," said Steve Squyres of Cornell University in Ithaca, N.Y. Squyres is the principal investigator for the science payloads on Opportunity and its twin rover, Spirit. "The impact that excavated the crater millions of years ago provided a golden opportunity, and the durability of the rover enabled us to take advantage of it." Imaging the crater's rim and interior, Opportunity inspected layers in the cliffs around the crater, including layered stacks more than 10 meters (30 feet) thick. Distinctive patterns indicate the rocks formed from shifting dunes that later hardened into sandstone, according to Squyres and 33 co-authors of the findings. 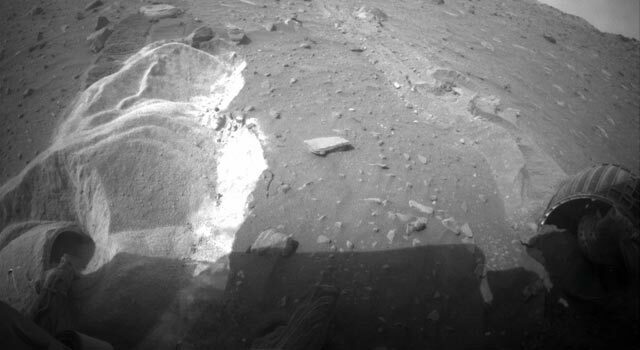 Instruments on the rover's arm studied the composition and detailed texture of rocks just outside the crater and exposed layers in one alcove called "Duck Bay." Rocks found beside the crater include pieces of a meteorite, which may have been part of the impacting space rock that made the crater. Other rocks on the rim of the crater apparently were excavated from deep within it when the object hit. These rocks bear a type of iron-rich small spheres, or spherules, that the rover team nicknamed "blueberries" when Opportunity first saw them in 2004. The spherules formed from interaction with water penetrating the rocks. The spherules in rocks deeper in the crater are larger than those in overlying layers, suggesting the action of groundwater was more intense at greater depth. Inside Duck Bay, the rover found that, in some ways, the lower layers differ from overlying ones. The lower layers showed less sulfur and iron, more aluminum and silicon. This composition matches patterns Opportunity found earlier at the smaller Endurance Crater, about 6 kilometers (4 miles) away from Victoria, indicating the processes that varied the environmental conditions recorded in the rocks were regional, not just local. Opportunity's first observations showed interaction of volcanic rock with acidic water to produce sulfate salts. Dry sand rich in these salts blew into dunes. Under the influence of water, the dunes hardened to sandstone. Further alteration by water produced the iron-rich spherules, mineral changes and angular pores left when crystals dissolved away. The twin rovers, Spirit and Opportunity, continue to produce scientific results while operating far beyond their design life. The mission, designed to last 90 days, celebrated its fifth anniversary in January. Both rovers show signs of aging but are still capable of exploration and scientific discovery. NASA's Jet Propulsion Laboratory in Pasadena, Calif., manages the Mars rovers for NASA's Science Mission Directorate in Washington. 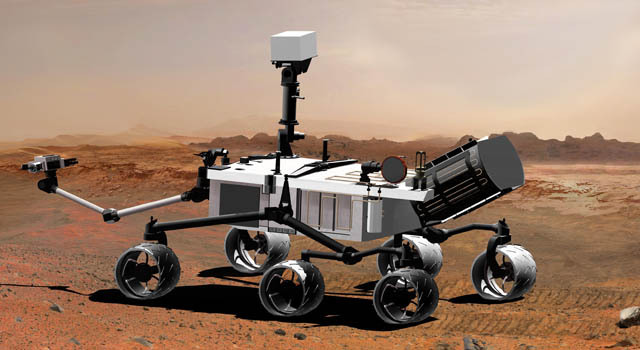 More information about Spirit and Opportunity is at http://www.nasa.gov/rovers .